Pez candy dispensers have been around for decades, and have a rabid following of collectors, as well as big and little people that love to dispense the candy out to eat to get their sweet fix. That has gravitated towards a widening array of Pez themes, including a nice group of Christmas Pez dispensers, with all the accompanying and most popular characters associated with the this particular holiday season. Every time a new group of Christmas Pez dispensers are released, a little change is made to help collectors identify which year they're from. For example, you could acquire new Christmas Pez in 2007, and they included a new snowflake design on the dispenser itself; something the prior Christmas Pez didn't have. Another way of letting collectors know when a new release comes out for a specific year concerning Reindeer Pez is the number of dots included on the collar of the Reindeer. When changing from the 2002 Reindeer Pez to the 2003 Reindeer Pez, the company changed from 9 dots on the collar to 8 dots on the collar. Some people that may not be avid collectors may scoff a little at these minor changes, but to know when the Pez dispenser was released is extremely important, especially if they are part of a limited edition. This probably wouldn't be as important for those who retain the original packaging of the Pez and which hasn't been opened, but for those wishing to sell a Pez without the original packing, differences in design help to let buyers and sellers know the parameters of when it was released. 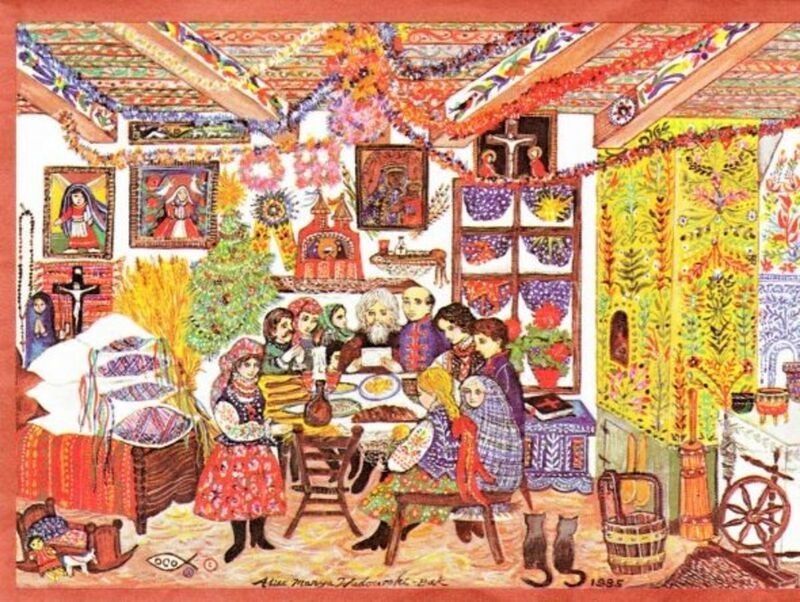 The specific Christmas designs created by Pez include Santa Clause, Mrs. Claus, snowmen, reindeer, polar bear, elves and angels. 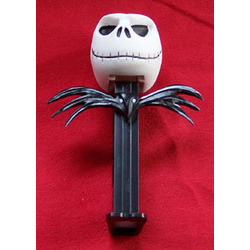 I've even seen a Jack Skellington Pez from "A Nightmare Before Christmas." 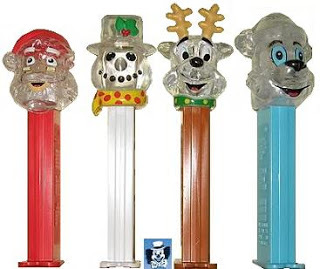 Other Pez design differentiators include the packaging itself; different designs on the dispensers; and those made of different materials, such as crystal used for the head of the Pez. And there was already the mention made concerning going from a place Pez dispenser to a Pez dispenser with design on it the next year. Even though there are numerous other specific design changes, the point is that it's in the design itself; both in the body of the dispenser and the head on top of the dispenser. Finally, there can be on Christmas Pez theme over the years, but a different design for the specific Pez theme. You can get a Santa Pez, but have a different looking Santa on the top. That's the same with a snow man as well, along with other characters. One difficult to identify Pez is the Pez Reindeer. Some of these Pez, depending upon the year, have antlers that are different in thickness. So to accurately identify them, you would have to know which year the thickness was changed. This is relevant when all other things are considered, the rest of the Pez head is the same, along with the Pez dispenser. Just remember to check the Pez carefully if you're looking to collect them, as these sometimes subtle design elements, especially on Pez no longer in the original packaging, are all that give a hint as to the year or span of years the Pez would have been made in. One specific Christmas design for Pez is in reference to making Pez strictly for the purpose of hanging on a Christmas tree. If you want to do that, just be sure to get some backup Pez of the same type to keep in the original packaging if you plan on selling them some day. Christmas dinner plates are one of the most important parts of setting an attractive and inviting table on Christmas Day, and when used in a complementary manner with a fantastic Christmas tablecloth, the combination can really put everyone in that..
With this first Christmas Pez of a snowman, there is included much of the traditional thought we associate with our amateur snow sculptures, including the black spots for the eyes and mouth, as well as the carrot for the nose. 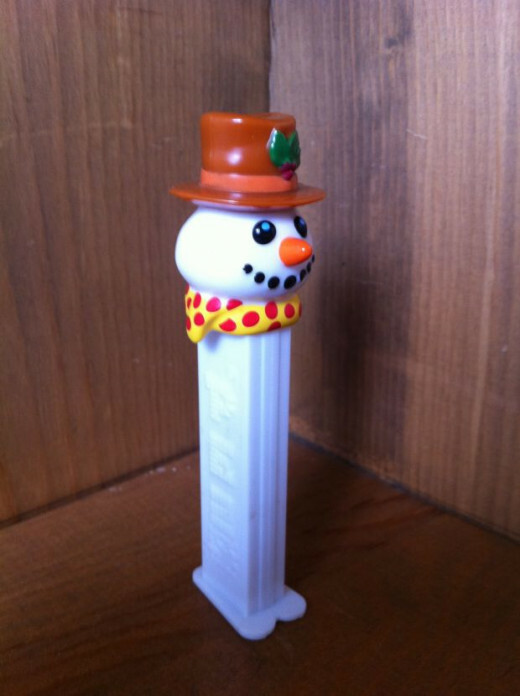 The top hat is a snowman accessory of the past, but still looks great with this Pez, as it would on a real snowman. The yellow scarf with the polka dots is a nice finish to the overall look. This is a fun Pez and a nice one for anyone's collection. Christmas Blister Pack PEZ Dispensers 12ct. The next Pez dispenser is a unique one, one that those who aren't collectors probably haven't seen before, and if they did, may not have known what it was if they didn't see the word "Pez" written on the stomach of Santa Claus. 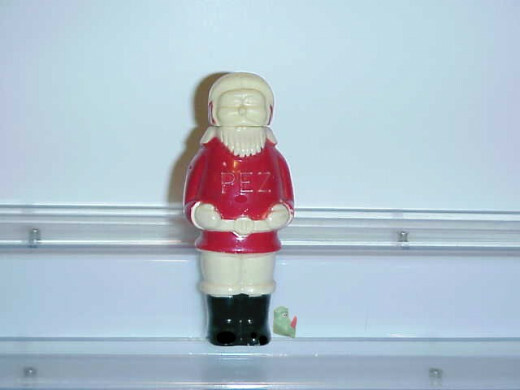 What's unusual is the Pez dispenser in its usual design is missing from this Pez Santa, replaced with a full body of Santa instead. Pretty cool. Jack Skellington has become a cultural icon ever since he appeared in "A Nightmare Before Christmas," and continues to be popular until this day. That has of course resulted in a large number and variety of products based upon the character to me made, with Pez taking an interest and designing a number of Pez dispensers based upon the character, including the one below. The head is very cool looking on this Pez, and I like it when wings like those of a bat are included in the Jack Skellington design. Even the shape of the Pez dispenser body has an unusual look that fans and collectors appreciate. Thomas Kinkade is among the more well-known and popular artists in the world today. For people who love his work, it doesn't matter what medium he chooses to express his art though. That's the case with this groups of wreaths I've assembled together. What's very effective about Pez Christmas products is they the company can take an existing design and simply add a piece of some type to allow it to be hanged on a Christmas tree, and suddenly there is an entirely new Pez product and item to collect. 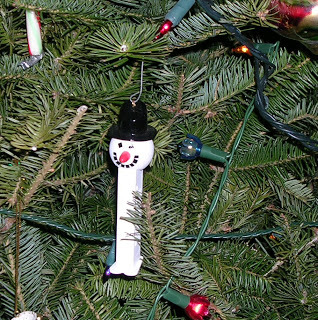 That's really a good idea because collectors like the option, and some do like to show off part of their Pez collection, and hanging it on a Christmas tree is a safe way to do it. Here are group of Christmas Pez dispensers, this time including heads that are made of crystal. That's a fairly recent phenomenon, and collectors like them, as do regular people that just think they're a good looking container to hold candy. These are similar and look and appearance as to how the faces look, with the crystal material being the major differentiator. 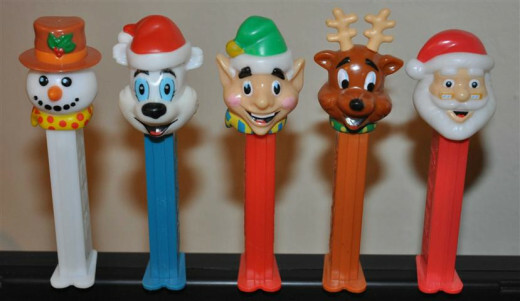 This is a group of more modern Christmas Pez, and if you look at photos of, or have Pez dispensers from the past, you'll easily recognize they are recent Pez designs. Whether new or old Pez designs, they all look fantastic, and I like how all of them have that nice, friendly smile as part of the persona they represent. Note the reindeer Pez with the dots on the scarf it's wearing. That's what was mentioned earlier about counting the number of them to know if they were made before or after a certain year. The antler thickness is another element to consider as to when they were made. For Santa and others, the shade of the color hue can be another way of identifying about when the Pez were made. 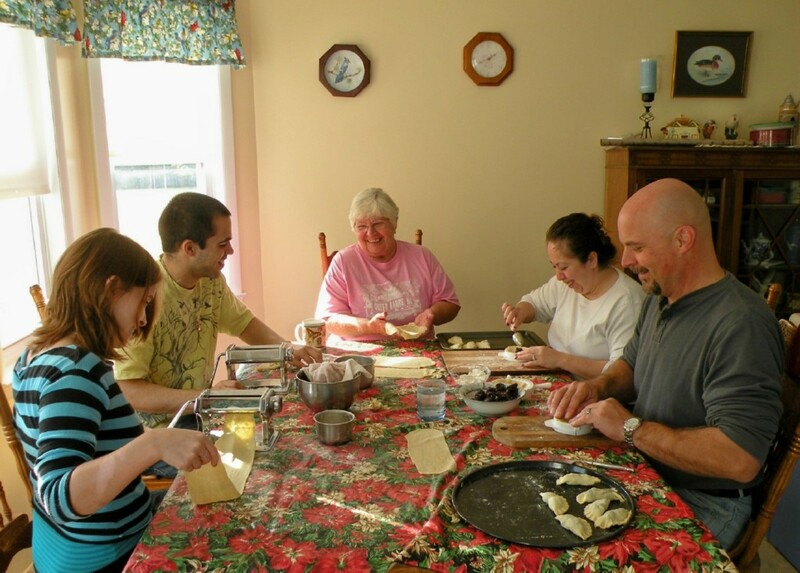 Some are lighter and darker, depending on the year they came out. Pez continue to be an extremely popular collectible, with many of them valued well into the hundreds of dollars each. And some of those are rare enough that it doesn't matter much whether or not they're in the original packaging or not, as long as they're in decent shape. These little candy dispensers are a great way to add to the Christmas décor, as long as you put them in a place they can be admired ... but not damaged. A good way to share Pez but not damage the valuable and desirable ones, is to buy some that are fun and enjoyable to look at, but of which you already have some put away to save, and you don't mind if they get handled and worn some. That way you can inspire others to start collecting or using them in their Christmas decoration theme, passing the passion onto future generations. nice pictures Awesome work keep it up a href=http://softwarespin.com/ Thanks for sharing. . . . . .
nice work am very happy to see your favorable standard. thanks admin keep it up. I had no idea that pez dispensers were such the collector's item. I love the Jack Skellington Pez. Very cute. I do remember Altoids had something similar-Curious George was on the cover, as in their slogan, Curiously Strong. Haven't seen that in years. Interesting and cute hub!